This is the UK Branch. The Nevis branch is at FXOpen.com. The Australian branch is at FXOpen.com.au. 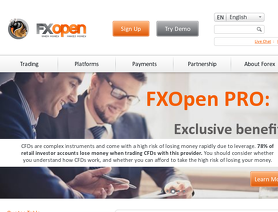 FXOpen UK is a forex broker. FX Open UK offers the MetaTrader 4 Desktop, MT4 Mobile and MT4 WebTrader forex trading top platform. FXOpen.co.uk offers over 45 forex currency pairs, cfds, global index, oil ,energy and cryptocurrencies for your personal investment and trading options.